Every day, Watch This offers staff recommendations inspired by a new movie coming out that week. This week: It’s 1994 Week at The A.V. Club, so we’re recommending our favorite movies of that year. Wong Kar-Wai commiserates. His Hong Kong, a city too forlorn to sleep, is the international capital of heartache. His movies, almost without fail, are tributes to that most exquisite of agonies, the dull ache of loving and losing. Most of them are in Cantonese or Mandarin, but their emotional language is universal: Anyone who’s ever been on the business end of a tough breakup will recognize a little of themselves in his rotating roster of scorned romantics, burning the midnight hours trying to forget that special someone who came and went from their lives. Remember the scene in the penultimate episode of Louie’s fourth season, the one of Charles Grodin scolding Louie for failing to appreciate his own glorious heartbreak? Wong Kar-Wai cosigns that scene. Of all the lonely laments the writer-director has authored in his quarter-century of filmmaking, Chungking Express remains the most purely magical—an effervescent blast of urban melancholia, shot over a couple short months in the hustle and bustle of Hong Kong. The film tells twin tales of rebound romance, both featuring young police officers who forge new connections in the aftermath of failed relationships. In one, a dumped detective (Takeshi Kaneshiro) pines for his ex, until a frustrated femme fatale (Brigitte Lin) drifts into his orbit. In the other, a different rejected cop (Wong regular Tony Leung) is pulled out of his funk by the daft advances of cinema’s most lovable Manic Pixie Dream Girl (Faye Wong). The two stories, both eccentric breeds of romantic comedy, complement each other well, the moodier noir trappings of the first half giving way to the screwball misadventure of the second. The dialogue, at least as translated, has a poetic humor: “We broke up on April Fool’s Day, so I took it as a joke,” says Kaneshiro’s character, while Leung delivers motivational speeches to the “depressed” objects in his apartment. Wong’s international breakthrough, Chungking Express came to America through Quentin Tarantino’s Rolling Thunders label. Like that director’s own 1994 offering, it’s a multi-story, pop music-fueled triumph that made movies feel new again. Even the rare viewer who finds nothing to relate to in its bifurcated narrative will have trouble resisting the staggering beauty of its imagery. 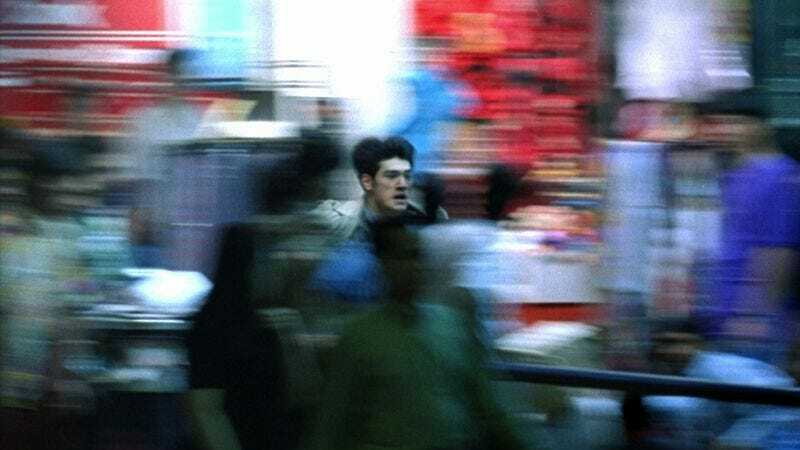 There’s not an unexceptional shot in the whole movie; master lensman Christopher Doyle seems to reinvent the capabilities of the camera, transforming the chase scenes into smeary reveries of nocturnal activity and helping pioneer a Wong signature, the sight of a single character standing still in the frame while pedestrians blur by around him. And Wong gets incredible mileage out of his soundtrack selections, including “What a Diff’rence A Day Made,” a Cantonese cover of The Cranberries’ “Dreams,” and “California Dreamin’” by The Mamas & The Papas. The latter blares no less than a half-dozen times, but it somehow never gets old; shrewdly, Wong picked a song that grows more likable with each spin. It worms its way into the heart and gets stuck in the head. Like a new infatuation. Or this movie. Availability: The Criterion Blu-ray and DVD of Chungking Express are out of print, but can be obtained from Netflix or your local video store.